Eight singers of an 80-member choir were seriously injured after a lifting stage in a grand theather in Bijie City, China, suddenly collapsed. 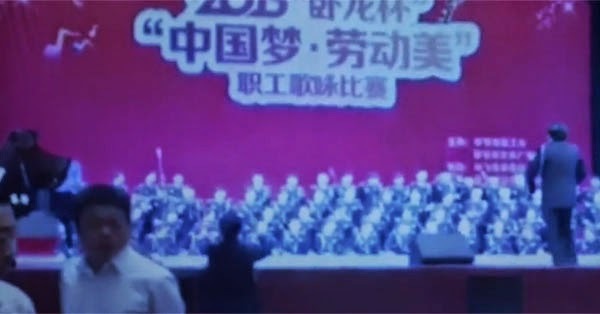 The terrifying accident, which was captured on video by a spectator and broadcast on China Central TV, occured around 3 p.m. last Saturday, May 9, during the police choir's rehearsal for a singing competition. Screams coming from people inside the venue can be heard in the 43-second clip as the choir fell straight down, as if they were "swallowed" by the stage that failed to hold their total weight. Some police officers were seen rushing to the stage to help their comrades while the conductor appeared to be shocked and did not know what do. Fortunately, no deaths have been reported and latest news say those injured are now recuperating in the hospital. An investigation to determine the cause of the stage failure is underway.